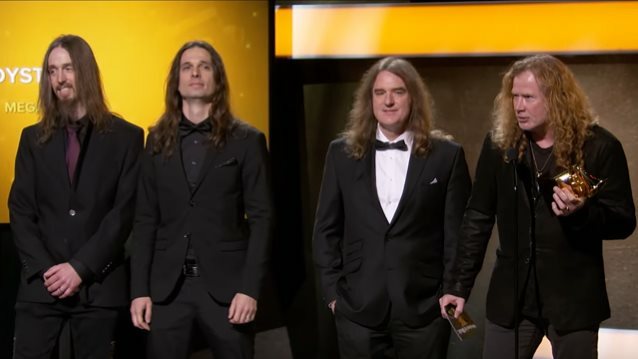 MEGADETH was honored with a Grammy in the "Best Metal Performance" category in the pre-telecast ceremony at the 59th annual Grammy Awards, which is being held tonight (Sunday, February 12) at the Staples Center in Los Angeles. MEGADETH was nominated for "Dystopia", the title track of its 2016 album. As MEGADETH approached the stage to accept the award, the house band inexplicably played the song "Master Of Puppets" from MEGADETH mainman Dave Mustaine's former band METALLICA. In his acceptance speech, Mustaine said: "Fantastic! Only took twelve tries to get this. Last time we were here, we were talking to Kenny G, and he asked me how many times we were here, and he goes, 'Well, eleven isn't that bad.' And I said, 'How many times did it take you?' And he said, Twenty-one.' And I was, like, 'Oh, my god. If it takes twenty-one times… I don't know if I'll live that long.'" Mustaine continued: "I wanna thank Jesus Christ, I wanna thank my wife, my children, all the band's wives and kids, I wanna thank our management, our label, our agent, our attorney, our crew, all of you, especially the metal community. I think it's a little weird that we ended up being category 69, but somebody's got a sense of humor." KORN - "Rotting in Vain"
PERIPHERY - "The Price Is Wrong"
Regarding MEGADETH's "Dystopia" nomination, Mustaine told the WRIF radio station in Detroit, Michigan: "I'm really, really excited. You know, it's hard, after getting nominated several times, to not become a little bit jaded, 'cause this is our twelfth nomination. It's great to be nominated — don't get me wrong; I love it — but it's also very bittersweet. "A lot of people would question, 'Do I wanna go there again and not get chosen to win? '," he continued. "I think it's great to be nominated, even if you don't win, because you get that recognition from all of your peers, and people get to see it that may not know who you are." Mustaine added: "I do think that it's kind of a drag sometimes when people win that are so obvious that they weren't supposed to win. There have been some times over the years — not just the ones that I was in, but some other ones — where the bands won and they had nothing to do with metal. I think the most famous one was the JETHRO TULL one," referring to the time in 1989 when METALLICA lost the "Best Hard Rock/Heavy Metal Recording" Grammy to flute-driven progressive rockers JETHRO TULL. MEGADETH recently completed a month-long U.S. tour with AMON AMARTH, SUICIDAL TENDENCIES, METAL CHURCH and BUTCHER BABIES. 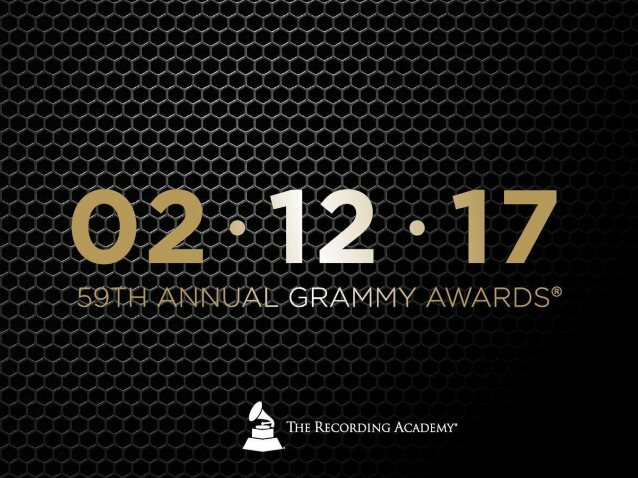 The Grammys are voted on by approximately 13,000 Recording Academy members, who are comprised of artists, songwriters, producers and engineers. More than 21,700 recordings were submitted for Grammys consideration this year. For 2017 awards, music must have been released between October 1, 2015, and September 30, 2016, in order to be eligible.